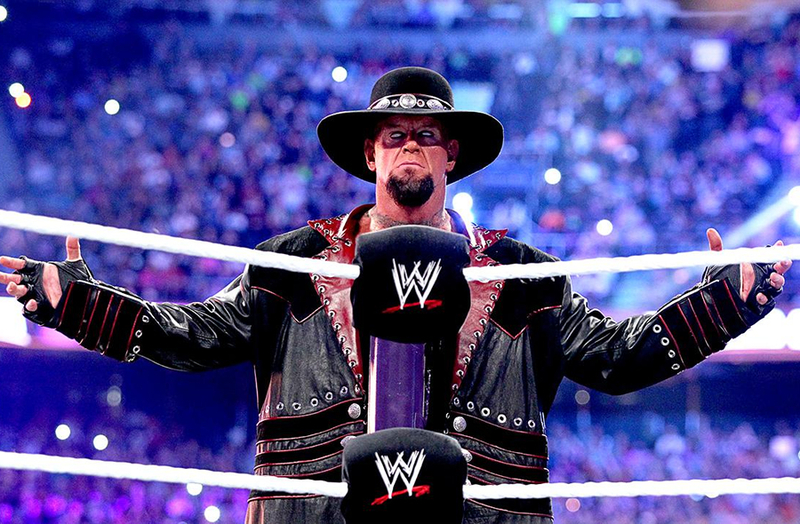 Should the Undertaker Work Wrestlemania 31? [dropcap]T[/dropcap]he last time we saw WWE living legend Mark Calloway, aka The Undertaker, was about ten months ago, at Wrestlemania 30, where his 21-year winning streak at the WWE’s flagship event was broken by Brock Lesnar. During that match, he suffered very legitimate injuries and he has yet to return to WWE TV. Now that the Royal Rumble is over, and the “Road to Wrestlemania” is officially underway, should the soon-to-be 50 year old (he’ll actually turn 50 just five days before the event) come back for another match? If I had written this post a couple of weeks ago, the title wouldn’t have been a question. I would have called it “The Undertaker Should Not Work Wrestlemania 31.” The last time we saw him, he looked absolutely terrible. He was slow, sluggish and very much not the Undertaker we’ve been awed by every year at the Wrestlemania. Now, as I said, he was severely concussed – to the point where he says he doesn’t remember a lot of the match – so the fact that he even made it through the match is a testament to his professionalism and his true grit, but it wasn’t a good look for him. He even allegedly collapsed back stage, and was rushed immediately to the hospital after the match. Also, the only thing really keeping him on the annual event is the streak. Over the last few years, he has rarely appeared in more than a handful of shows outside of those used to pump whatever matchup he was set to have at ‘Mania. This is all the current Undertaker offers fans. That is not at all a knock, as those shows, and usually the Wrestlemania match itself, are almost always extremely entertaining for us fans. It’s just a fact that he’s a guy that’s going to contribute to a month or two worth of shows over the course of the year, tops. Why risk his long term health for that? I think Wrestlemania sells itself, especially now with the WWE Network only costing $9.99 a month (you’re welcome, WWE). Does the company really need ‘Taker to come back again? And then, there’s this: Last night, I watched the premiere of the WWE Network’s new show, 24 (no, there’s no Jack Bauer), which chronicled the last 24 hours before Wrestlemania 30 in New Orleans. They showed a lot of backstage stuff, including the lead in stuff for Undertaker’s match against Lesnar. They used a piano version of his famous theme song over the shots of him coming to the ring, and leaving afterwords, and I still got those Undertaker entrance chills. His entrance is probably the most iconic in the history of the business. The show showed that it’s still awesome, and it’s still a draw for his fans. I have no doubt now that, if Calloway decides to grace us with his presence once again in San Jose, it’s going to be a spectacle. What they need to ask themselves is this: was he sluggish and slow and out of it because of the severe concussion, or did he actually lost a step over the course of the year? You’ll remember that his match against CM Punk the year before that was awesome. Could it even be that the choice of opponent is what doomed ‘Taker? Lesnar is a great professional wrestler, but he’s very big and very phsyical, especially for a then 49 year old to wrestle against. 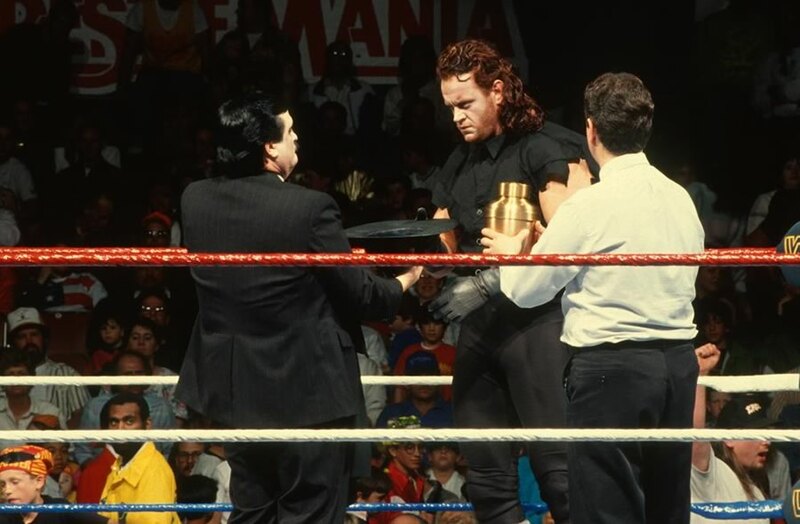 Perhaps if they pair Undertaker with someone smaller, who can help carry him through the match a bit, it will keep him safe and lead to an awesome match. Who could that be? The one who would make sense from a physical standpoint is Daniel Bryan, but that certainly wouldn’t make sense from a storyline point of view, and might not even be what the fans want. Who would they cheer? Anyway, I think I’m leaning towards wanting him to return for one more match at this year’s Wrestlemania because I find it hard to have the Undertaker, one of the most respected and talented professional wrestlers of all time, go out with a wimper like he did against Lesnar. They could bring him back against a safe, yet valid, opponent, bill it as his retirement match and have him go off into the sunset with a huge win in San Jose. They can’t put him in another “war” type physical match like last year. It’s too dangerous. One more match, and that’s it. Hell, they could even skip this year and bring him back for 32 in Dallas, in front of 105,000 people. That’d be a great way to bow out, right? Just for fun, watch ‘Taker’s first Wrestlemania match, in 1991 against “Superfly” Jimmy Snuka. As long as there is an intriguing opponent for Taker, he should wrestle. As a long time fan, I feel they have to do Sting-Taker. I know it won’t happen cuz we re getting Sting-HHH but I can’t help but think this is a mistake. It smells so much like a missed opportunity if they don’t do it….just like when they missed on Hogan/Flair at WM8 and Austin/Hogan at WM18. The only thing that holds me back from being on board for a Taker/Sting match is the age factor. Taker is 50, and Stinger is 55. Not that these guys need to be carried, but pairing each with a younger opponent might create a better match. I know HHH is no spring chicken himself, but the last few matches he’s wrestled in have been pretty great. Granted, he’s wrestled against younger opponents who possibly make him look better, but i think a HHH/Sting match has less potential for injury and old age becoming a factor. The more I think about it, the idea of Taker vs Sting is very cool, and could be booked/promoted in a great way too. Those two guys helped their companies basically stay afloat at different times in their careers. They’re true legends of the sport, as Tony Schiavoni would say. Yeah…WM is all about spectacle and not so much match quality. They’re both on the roster…..they should fight. Might have been cool to put Vince and bischoff/Flair in opposing corners.